NCC team make it to football finals! Students who are part of Nelson and Colne College’s social football team are celebrating make it through to the finals of the Lancashire FA College Recreational League. 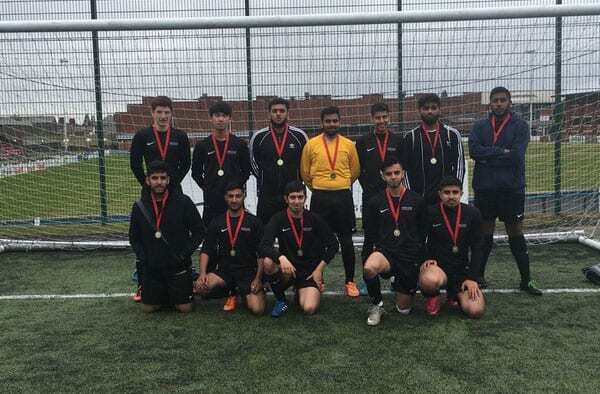 The 11-a-side team gave a strong performance throughout the league, beating Wigan and Leigh College and Lancaster and Morecambe College in the group stages, before triumphing over Burnley College in the semi-final. The NCC team were beaten at the last hurdle by West Lancashire College, who walked away with a 3-1 victory, after 20 minutes of the score remaining at 0-0. College Sport Maker Alexis Walker said: “These students had not played together as an 11-a-side team before this league, and some students had never even played for an 11-a-side team before in their life. A free Team 19 5-a-side football league was launched at NCC at the beginning of the year, as a response to student demand. It attracted more than 95 students and 10 different teams, and plans are already in place to deliver another league in the next academic year. As a result of its success, the league was developed into a social football session and a team was consequently formed to represent the college in the Lancashire FA College Recreational League. The team was made up of students from a wide range of curriculum areas – including IT, Business, Health and Social Care, Science, Engineering, Sport and A Levels. Armaan Moghul, 18, from Nelson, said: “Alexis has been a really good teacher and she has really motivated us – to get to the final was great. “Doing activities like this helps you to build teamwork and confidence – I would recommend other students to get involved. NCC has a range of sporting enrichment opportunities for students from all curriculum areas and of all abilities to enjoy. These include archery and boxing, to yoga and walking.